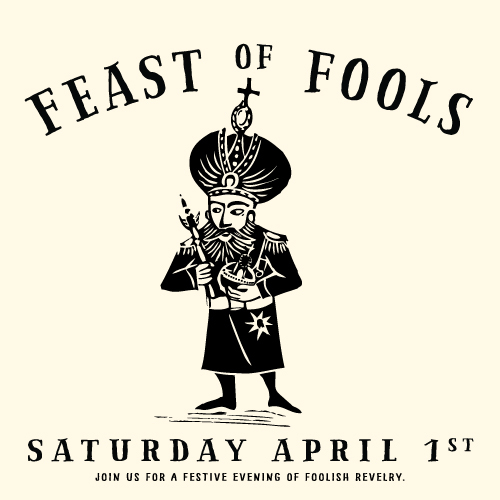 We invite one and all to celebrate the absurd and join us for our inaugural Feast of Fools on Saturday April 1st. Since the days of Chaucer, the Fool’s Day has played an important role to society’s health by allowing folks to let off a little steam. Medieval clerics celebrated the Fool’s Feast as an outlet for their innate foolishness, lest they be too silly year round. These days, the Fool’s Day is a reminder not to take ourselves too seriously. Please join us for a festive evening of foolish revelry, delicious food, and of course beer! Irreverent behaviour, good-natured pranks, and silly costumes encouraged. Present a joke and receive a Free Beer. $16 for a beer with dinner: BBQ brisket/salmon sandwich, house coleslaw, imperial mac n’cheese, and tarte à la bière.